Prior to replacing ceramic or stone tiles, it’s important to know why the replacement is necessary. Replacement is due to color change or original tiles are no longer available. For the partial repair of a tile assembly, you may need a written waiver in writing indicating you are not responsible for the rest of the tile assembly. The most common mortars used for replacing tiles include dry-set mortar, rapid setting mortar, latex/polymer-modified Portland cement mortar, LHT mortar, and epoxy bonding mortar. 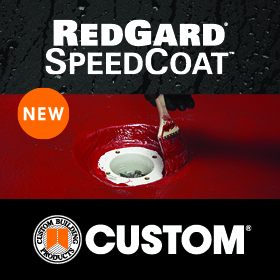 Always follow the setting manufacturer’s installation requirements and setting times required prior to grouting and prior to allowing foot traffic. Drywall mud and paint act as bond breakers and must be removed before installing tile. Dry-set mortar is suitable for thin-bed installations with a thickness of 3/32” to ¼” after the tiles are embedded, while a rapid setting latex/polymer-modified mortar is suitable for a quick turnaround time as a faster setting mortar. Further, latex/polymer-modified Portland cement mortar is required for the installation of porcelain tile and is recommended for the installation of impervious stones including quartzite and slate tiles. Dry set mortar (LHT mortar) for large and heavy tile (formerly medium bed mortar) is suitable for installation as a bond coat from 3/32” to 1/2“-thick without the use of wire reinforcing. LHT mortar is preferred for large format tile with one side greater than 15” in length, or tiles that weigh 5 lbs. per square foot or heavier. White mortars are recommended for installation of light-colored marble tiles and nearly all onyx and limestone tiles. Epoxy bonding mortar is recommended for installation with fiberglass mesh reinforced stone tiles. 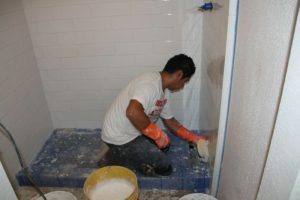 Having all the necessary materials on-hand prior to the removal and replacement of tiles will save you time and money. Not only should you have the correct installation tools, but you must inspect and verify that the tile(s) are acceptable to use for the replacement. Also of importance is having the setting materials available, including grout, adhesive/thin set mortar, or mortar including wire reinforcing, if necessary. Improper spot setting of mortar led to a huge installation failure. 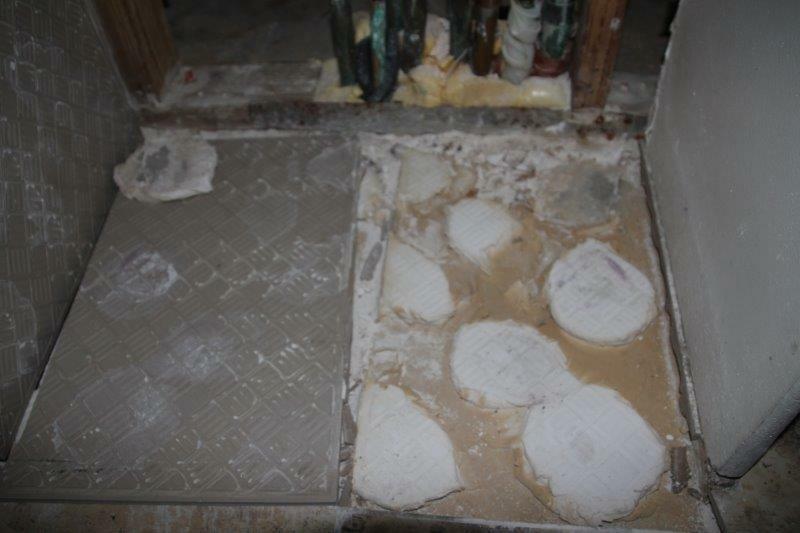 Taking precautionary steps to protect the surrounding area is good practice prior to removing the tile(s). Saw cut or remove the adjacent/surrounding grout to the tiles being removed to prevent damage to adjacent tiles during tile removal. Remove the tile(s) and save or properly dispose of the removed materials. 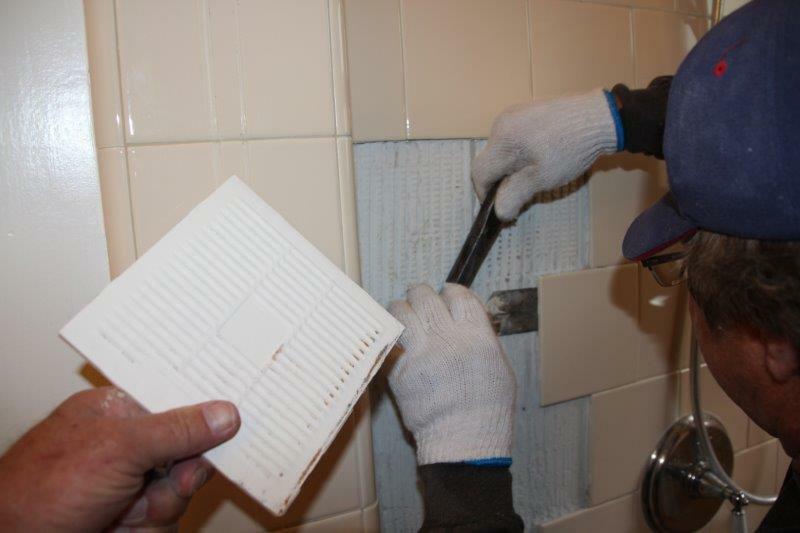 Prepare the substrate for replacing and/or installing the new tiles. If the installation is in a wet area (sauna, shower, etc. ), then perform a water test to make sure the assembly does not leak. Now that you’re prepared with the correct tiles, tools and installation materials, you’ll need to work to achieve at least 95% contact and coverage. This can be achieved by back-buttering each tile with bond coat, or by selecting a notched trowel sized to facilitate the 95% coverage. Key the mortar into the substrate with the flat side of the trowel, and comb with the notched side of the trowel in one direction. 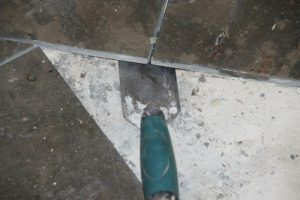 Embed the tile in the mortar by beating-in, pushing in a direction perpendicular to the combed ridges, or other means to achieve the 95% contact and coverage. The 95% contact and coverage shall be sufficiently distributed with maximum coverage with the corners and edges fully supported. Where replacement includes a larger amount of tile, periodically remove and check a tile during installation to ensure that proper contact and coverage of mortar and tile is being attained. 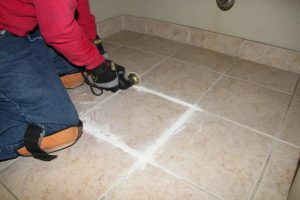 A tile leveling system may be used to ensure the finished tile assembly is smooth and lippage free for larger areas of tile replacement. Once the tiles have been firmly set, the next step is to grout. First, verify that the grout joints are open and clean. Remove any excess mortar between the tiles, as well as any spacers, strings, ropes or pegs if a tile leveling system is not used. Now you’re ready to install and cure the grout following the grout manufacturer’s installation, cleaning, and curing instructions. 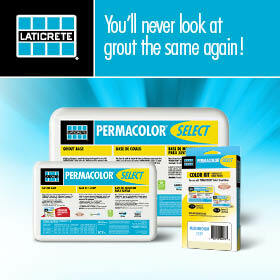 If necessary, protect the finished tile and grout assembly; however, covering the replacement tile and grout with polyethylene or plywood in direct contact with the floor may adversely affect the curing process of grout and latex/polymer-modified Portland cement mortar. If the tile or stone tile is absorptive, then pre-sealing or using a grout release may be necessary prior to grouting. If tiles and grout were removed and included any caulking or movement/expansion joint in lieu of grout, then you’ll need to install/replace the caulking or movement joint in the same locations from the previous installation. If the removed tiles were installed over backer board, ANSI A118.10 water proof membrane, ANSI A118.12 crack isolation membrane, or radiant heating, then any repair for the underlayment should follow the underlayment’s manufacturer repair recommendations. Tiles did not bond due to tiles not beat in or thinset was skimmed over prior to install. 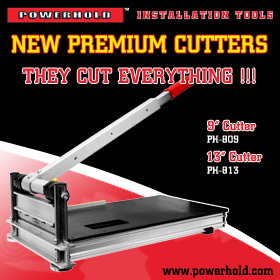 When you find yourself in a position where you’re unfamiliar with the installation requirements, I urge you to consult with the product’s manufacturer. Highly trained and experienced technical representatives are available to answer your questions and concerns. Further, you can always refer to the TCNA Handbook for Ceramic, Glass, and Stone Tile Installation and the American National Standard Specifications for the Installation of Ceramic Tile ANSI A108, A118 and A136 Material and Installation Standards for proper assemblies. Previous : CFI at 25: Has Anything Changed? You Bet it Did!